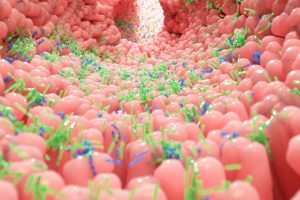 It is exciting to learn and discover just how many functions are directly governed by the microbes that live inside us in particular those in our gut the small and large intestines. Their interaction, diversity, and responses affect our emotional stamina, how well we digest our food, how little or much inflammation we carry, the cravings we have, and how much energy is at our disposal. This is particularly true of our Gut Microbiome - the locus of 80% of our immune system - the small and large intestines. Emotional roller coasters are initiated by a lack of microbial action that in a complex pathway produce serotonin and other essential chemicals governing our mood. This information travels along the vagus nerve - from the bottom of our spine to the top of our head - continuously informing and adjusting communication between the different nervous systems. Compensation and adjustments are constant and it makes sense to offer our microbiome a diversity of nutritious foods for maximum health and the occasional challenge. 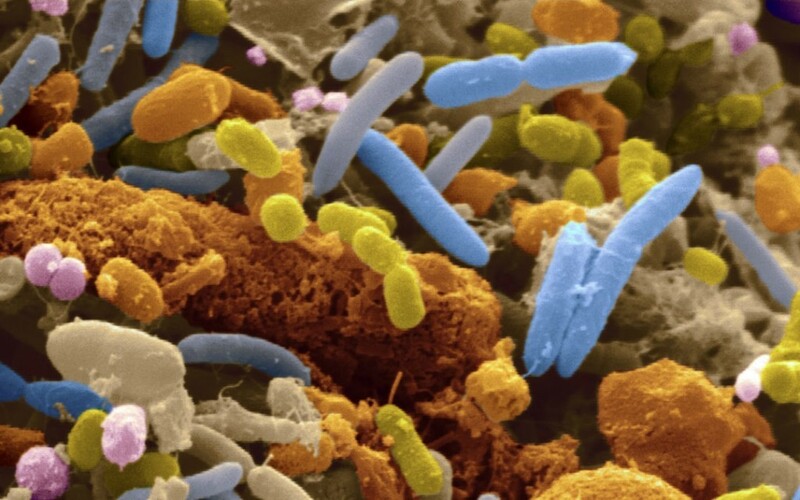 A beautiful picture of gut microbes lining the intestinal walls, where they fulfill a variety of functions for us. Studies over the past 12 years show great promise for a new and individually focused model of health and healing. No more ‘one size fits all’. Individual knowledge of our own microbiome becomes essential. It is not always easy to find a healthy balance of exercise, movement, laughter, meaningful connection, love in its many forms, dancing or spending time celebrating nature. Even though our life is meant to be a steady flow of life force, fed by this beautiful functional energy inside of us, the fast pace of our lives and the demands on our energy can feel overwhelming. Sometimes it feels if we could only get out of the way, life would leave us alone. Alas, the demands to engage are fast and furious and we sacrifice much of our native health to the pursuit of financial and scholastic gain to support our lives. The good news that helps us maintain a healthy balance is the knowledge that we have access to. Doctors of Functional Medicine have picked up the slack of the allopathic model and we now see a powerful rise of tests and services supportive of a whole body approach. Traditional Naturopathy and other natural health approaches have always honored the gut as a central core of wellbeing and we are glad that across disciplines professionals are working together to build a strong educational foundation for all people to learn from. 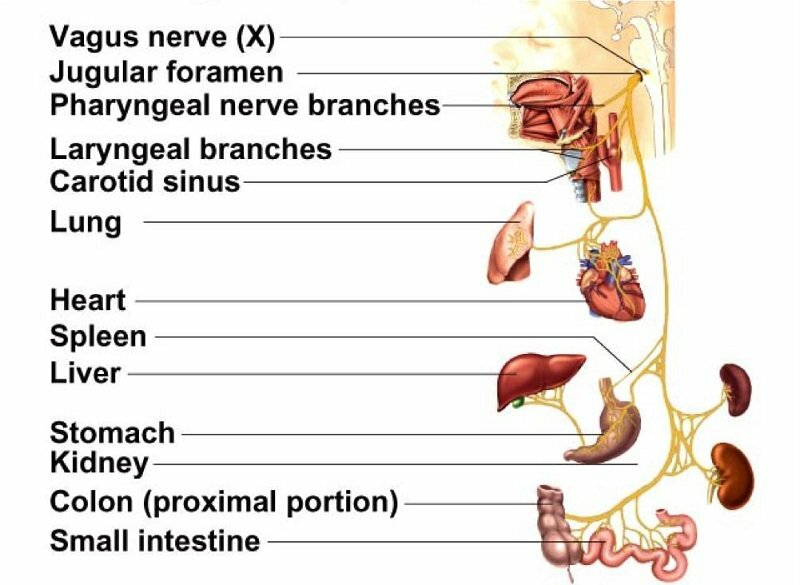 One of the most vital players in the communication of the gut brain with direct output to all part of the body is the vagus (long) nerve that travels from the brain stem right into the depth of the intestines and governs much of the nervous system’s signaling to the rest of the body. The vagus nerve and disruptions in communication among the nervous systems is implicated in autistic spectrum disorders, epilepsy, anxiety, depression, brain problems and other neuro-degenerative diseases. CBD Oil has shown affinity to heal the severed connections of the Vagus nerve in a similar way as castor oil packs have shown to create new connections when applied directly across the abdomen. The invisible power of natural methods go a long way to help calm inflammation which underlies all chronic and painful imbalances. Being aware of such an invisible and highly sensitive eco system, we are invited to focus on our diet and habitual life style from a survivor’s viewpoint. Until we are aware and serve our microbiome, we will undergo changes. It’s preferable and easier to be preventive about our health. It feels like a more ancient power is making us aware that ignorance is no longer permitted. We cannot ‘un-know’ what we now know to be true. Those who have lived to eat may change to ‘eat to live’ and take their gut health more seriously. Our inner terrain is a carefully balanced environment where active beneficial bacteria interact to keep the upper hand over pathogens and destroy intruders with regularity. So let’s feed ourselves the healthiest food we can find. Daily excitements causing the stress hormones adrenaline and cortisol to run our survival reflexes and put an extended load on our central nervous system. We experience insufficient recovery and the para-sympathetic nervous system is too challenged to restore our sleep. You know when you’re in this position that, even if you take a vacation, chances are the moment you let down, your body takes the opportunity to heal, cleansing waste and toxins and you think you got sick … 🙂 So when you rest, do so consciously, drink plenty of water with lemon juice, or apple cider vinegar to help the system cleanse and lubricate. A few capsules of charcoal before bed, help to take out the toxins. What about testing? Early personal tests for microbiome flora showed up types of microbes and how our stool samples might compare to others in age, race or gender category. Much more specific and individual, we now have www.Viome.com. Using meta-genomics and AI, their system is capable of analyzing the way our entire microbiome interacts and brings us clear suggestions on what foods, herbs, supplements to eat and which to leave out. This serves our individual needs for balance. Other test options and services can be found at www.Thedr.com. This gives scientists a report of all of the genes that the bacteria are expressing and what these genes do. The expressed genes are called transcripts. 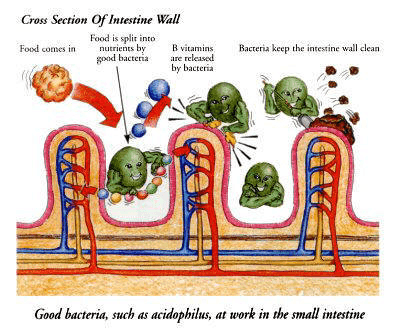 Some of the transcripts, for example, show that the bacteria are breaking down certain foods, while others show that they are making beneficial substances such as butyrate. Butyrate has a host of beneficial effects: maintaining our gut lining, helping with insulin sensitivity, suppressing inflammation, and even controlling our human gene expression. They have further found that we may share 1/3 of microbial activity with other humans, but 2/3 of our microbiome are entirely individual and unique. We are each our very own composition of organisms that live and thrive with us. What that means to us is different for each person. With a clear list of suggestions, Viome allows us to tailor diet and lifestyle to what actually works for us. Together with a smart phone app, we can carry our recommendations with us to the store or travel with it, without losing the connection to what is optimal food for us. To just be a little geeky: You may have read that the bacterial count outnumbers our own cells by 10:1 that is not not actually correct. The ratio of human cells to bacterial organisms in our body is more like 1.3:1, and not the often cited 10:1. https://endpoints.elysiumhealth.com/microbiome-explainer-e345658db2c The 10:1 model from the 70’s is inaccurate and has since been outdated. When we tax our digestive system with low quality foods such as fried, processed, contaminated, additives loaded, man made foods and add synthetic medication our system gets seriously challenged. When we overeat, don’t chew sufficiently, eat in a hurry, or when we flush down food with liquids, whole chunks of improperly broken down food causing fermenting, nearly indigestible material now enters the small intestine. Difficult to manage such chunks, there occurs an overload similar to dealing with debris from a rockfall: the larger the pieces the harder they slam against the valves into the large intestine. Insufficient absorption of nutrients, bloating, gas, fermentation ensue. Such discomfort favors the pathogenic organisms that live in our gut waiting to thrive. Since nature is not selective as far as its organisms are concerned, in other words, it doesn’t favor one over the other, we have to make sure that our inner terrain remains inclined towards our health and thriving. The only reason for us to get sick, is when our microbiome has become imbalanced and every meal we eat now feeds the opportunistic organisms who demand certain foods they like to thrive on, instead of what nourishes us. The results are cravings as we ‘mindlessly’ reach for sweet, crunchy, processed, salty foods, ice cream, sugary drinks, all stimulated by a demand of the pathogens now trying to take over our body. We seem to be nearly unable to resist their demands, resulting over time in inflammation, infections, joint and muscle aches, abdominal pains, bloating, indigestion, irregular bowel movements, foul smelling gas, constipation and diarrhea. Most pathogens are ever present in the human body as part of the native microbiome, but are kept well in check by our native beneficial gut flora that acts as our protection. We don’t actually ‘catch’ colds or the flu or a virus, it’s more like their presence is easily rendered harmless when our good bacteria operate in the plus. When we’re run down and fatigued, pathogens thrive and our microbes decide a fever would be great to burn off all those unfavorable critters. Let’s be clear, you don’t want to chill a fever, it’s a vital defense we need. The myriad of live and active friendly bacteria have a big job to do and they live and colonize best in an environment high in fibers and high in polysaccharides (their favorite food). Once they are offered the right conditions to re-colonize the intestinal tract, they begin the work of eliminating the pathogens, which can cause some discomfort for a few hours as the waste is leaving the body. I believe that anytime we undertake such change, we need activated charcoal to help gather the toxins and safely deliver them to be eliminated. The die off from pathogens and the waste of yeast organisms for example, can cause quite a gaseous and uncomfortable reaction for a day or two. Be easy about this, it’s not the flu or a recurrence of what you had, as long as you are following the guidelines of clearing the negative organisms and see their elimination through the natural channels of the body. “A lot of the food we eat, we don’t digest well, but our bacteria can digest it for us and we take the energy. So we offer the bacteria food and lodging, and in return they convert food to energy. They decide what is and is not toxic to our body, without these bacteria, survival would be difficult. 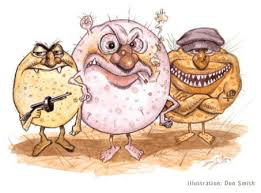 the immune system in our gut is the largest in the body.” Stephen Masters Collins, Canada. Eating to Live: We want to feed ourselves with foods that promote glowing health and provide us with energy. Technically, according to our gut capacity, most of us are better suited to being plant eaters. The insane overreach into animal foods has caused a crazy and unhappy amount of disease all across the world. Today, we are quite certain that for most people animal flesh produces a highly acidic inner terrain leading to putrefaction, chronic inflammation and disease. Choose your food well, eat produce as close to where it’s grown as possible. Eat it as fresh as possible, get to know your farmers, how they grow, what they use. You can actually feel the vitality of freshly picked greens from the farm and there is no comparison with the flat energy of produce - even if it’s organically grown, after it has traveled for 3000 miles. 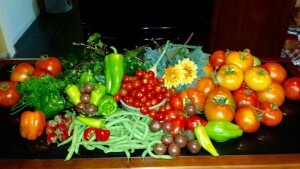 After a while that’s all you want to eat, fresh from the garden, from the fields, from the trees and bushes. To Your Health! These blogs are intended for information and education only. At no time are any of the information or suggestions on this website intended to diagnose, treat, prescribe or otherwise take the place of individualized care by your health care professional. Anyone accessing or downloading these handouts and wellness suggestions does so at their own risk and holds the author(s) of this blog harmless and takes full responsible for their own wellbeing. Loving our Hearts – no matter what: You deserve more Love not less!